These are amazing especially if you like peanut butter. Bake brownies according to package directions in a 9x9 pan lined with foil. During last 5 minutes of baking, remove from oven and sprinkle chopped peanut butter cups and chopped peanuts on top. Return to oven for remaining 5 minutes to melt the chocolate. As soon as you pull them out of the oven, spread the melty peanut butter cups/peanuts to smooth over the top. Let brownies cool. Next in a microwave safe bowl combine chocolate chips, peanut butter, and butter. Heat in microwave for 1 minute, stirring when done. If needed, continue heating in 20-second increments until chocolate chips melt. Stir in cereal, vanilla and salt until evenly combined. 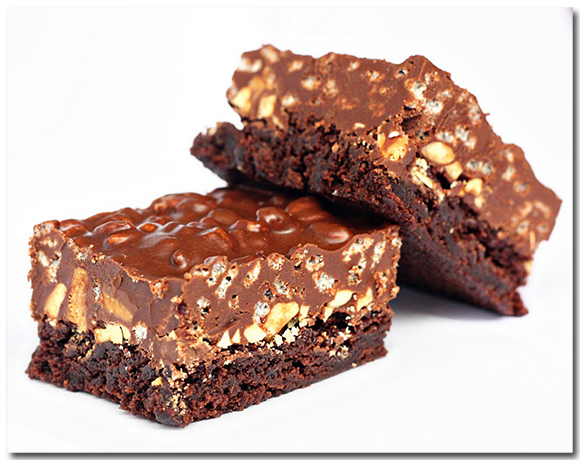 Pour over brownies and smooth. Chill chocolate until set about 2 hours. Store in airtight container. You can store these at room temperature or in the refrigerator.